YOU CAN DO THAT? REALLY? Mr. Iknead and I woke up this morning still wondering about the predicted government shutdown, even though we pretty much knew from last night that nothing had changed or had been agreed upon. This hits pretty close to home for us – Mr. Iknead works for the State of Arkansas, which in turn is contracted by the Feds, so we’re sort of up in the air. I feel very, very fortunate that at this point in our lives we don’t have to worry about our finances and if Mr. Iknead is furloughed for a bit, it’s not a crisis situation. I know others who are not so fortunate. Thank you, Mr. Iknead, for the austerity program, even though I gripe about it sometimes. 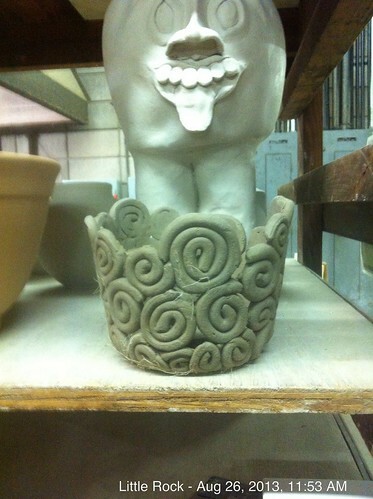 Pottery class is going well. Teach told me yesterday that I definitely had gotten the hang of using the wheel and with practice, I’ll get better at it. Still have nothing post worthy, but I’m planning on going in to work on the wheel more this week and hopefully, I have something at least minimally postable. The first Diamond State Fiber Festival is this weekend. I’m really looking forward to it and I’ve already got some extra money budgeted for whatever strikes my fancy (up to a point, of course). Hoping to come home with enough fiber to keep me spinning for a little while, at least. Violet, yeah, that’s my wheel’s name, is making the trip and hopefully, I’m going to learn a lot in the beginning spinning class I’m taking. I’ll take lots of pictures.